It always surprises me the little ways my girls are just like me. Sofie’s always cold in the car and prefers to be snuggled under a blanket. I turned her car seat around to face forward a few months ago and since then she’s been having a hard time keeping the blanket in her lap. So I decided as the days were getting colder and she actually needed to have a blanket in the car, I was going to make her one that would stay attached to her car seat. I didn’t want to interfere with the clips, since safety is the most important, so I designed the blanket to attach to the seat through 2 big button holes I made to go around the lower clasp. Since it doesn’t fall out of her seat, she can either snuggle it up around her, let it fold in half over her legs, or she can put it entirely under her legs and not be covered with it at all. I also thought ahead and made it long enough to cover her legs, but short enough that it couldn’t get dirty from her shoes. 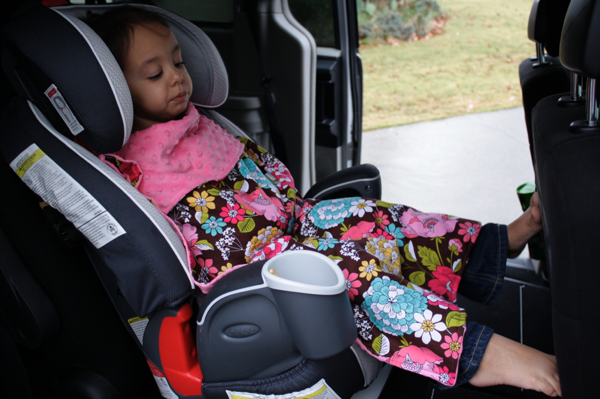 This makes it the perfect size to go from the car seat to the stroller! 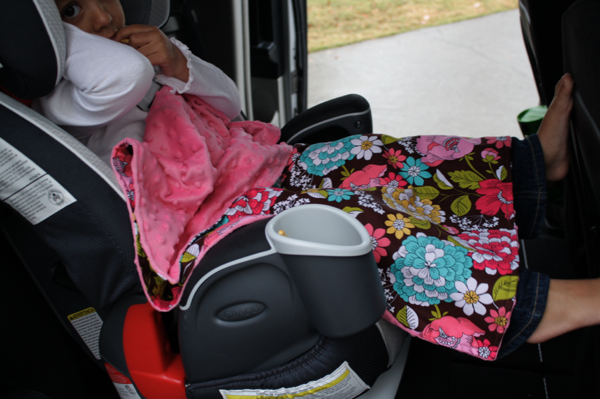 The blanket can stay attached to the seat when they’re not in it, so you’re sure never to lose it. 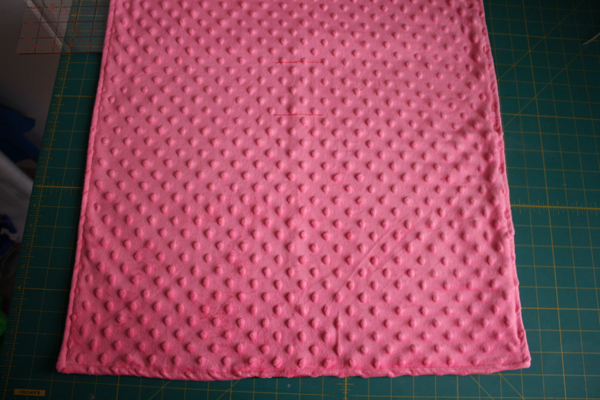 **If you don’t have a sewing machine or are cautious about the sewing for this blanket, you could achieve the same results by simply cutting 2 slits in a piece of fleece. 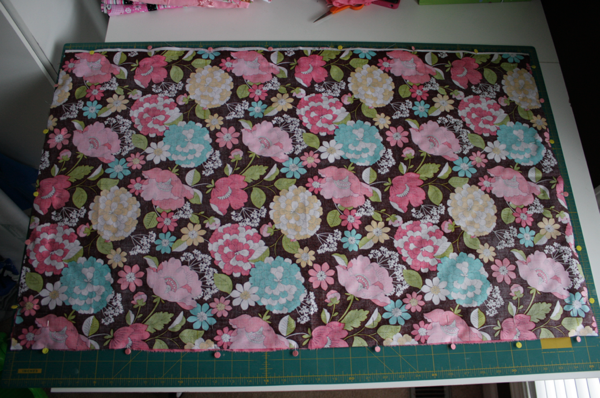 I cut my minky and cotton fabrics in half to make each piece 36″ by 22″. 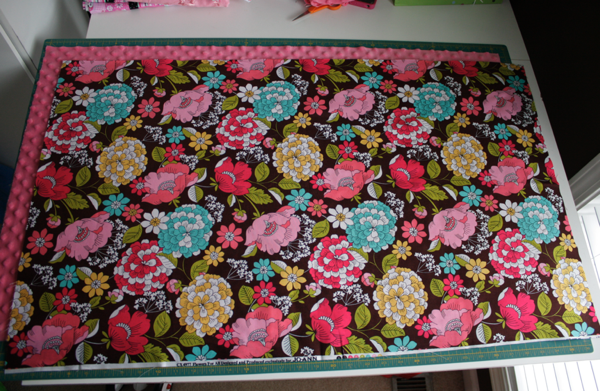 I also made Chloe a blanket for her car seat, even though she will rear-face for another year or so. Place them right sides together and pin all the way around. 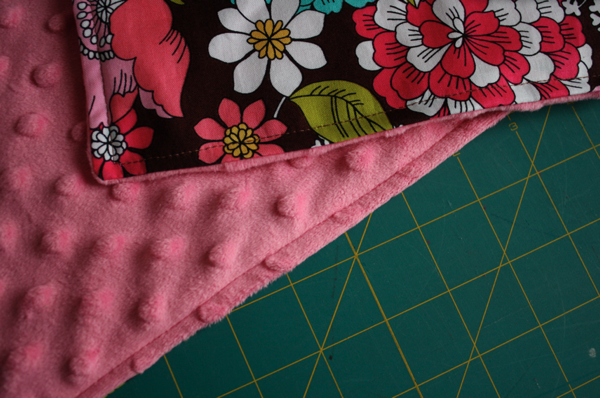 Sew around the perimeter, I used a 1/2″ seam allowance, leaving a hole a few inches wide to turn the blanket through. 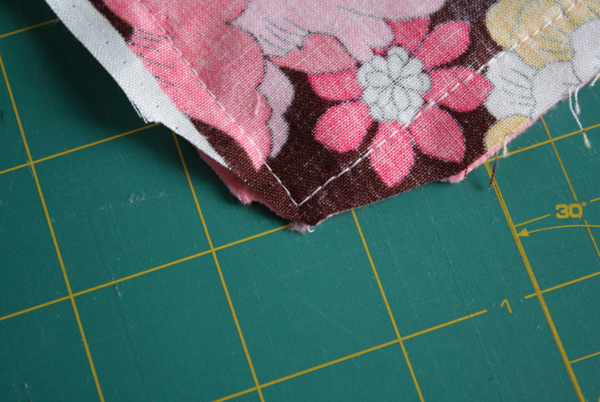 Clip the corners at an angle to cut down on the bulk when they’re turned. This doesn’t have to be pretty (obviously!). Turn the blanket and poke the corners out. Use your hands to “iron” the edges even, but don’t actually iron it!! I made the mistake of ironing dot minky once, and it was tragic. 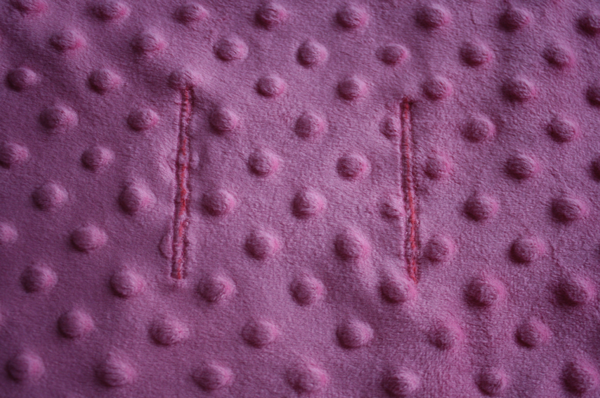 Pin the hole closed and top stitch around the entire blanket, closing the hole. 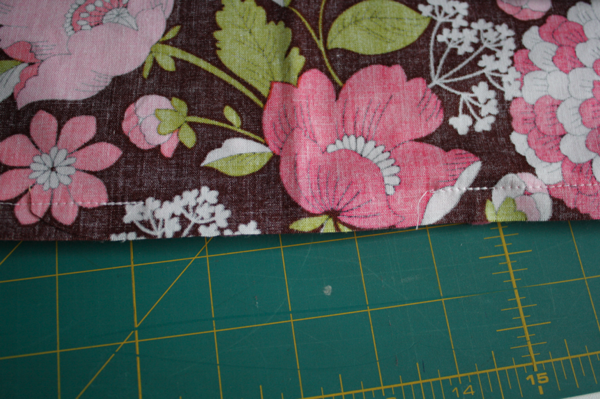 For the buttonholes, I decided to make them 2.5″ wide (and in hindsight, wish they’d been a little smaller) and 3″ apart. 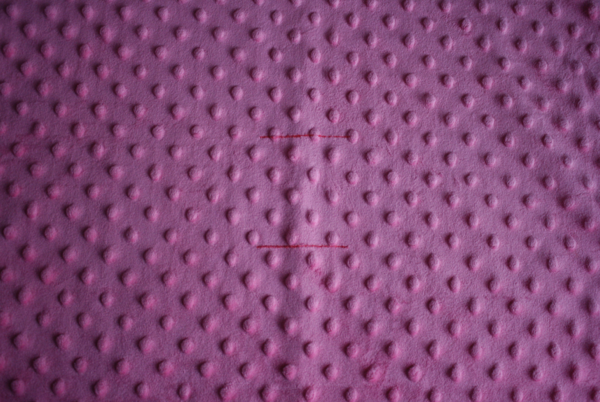 I measured 12.5″ from the bottom of the blanket and marked the first hole, then measure three inches above it and marked the second. 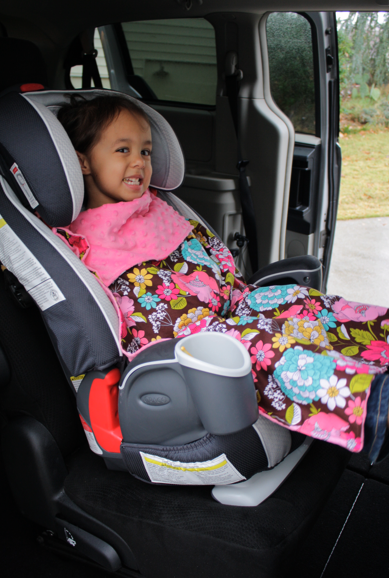 The blanket is long and skinny to accommodate the shape of the car seat, so make sure you’re doing them the right way! then cut them open and you’re done! This was quick, easy, and will keep her comfortably warm all winter! So genius. I just adore your blog! Thanks for all the great ideas. Love this idea!! 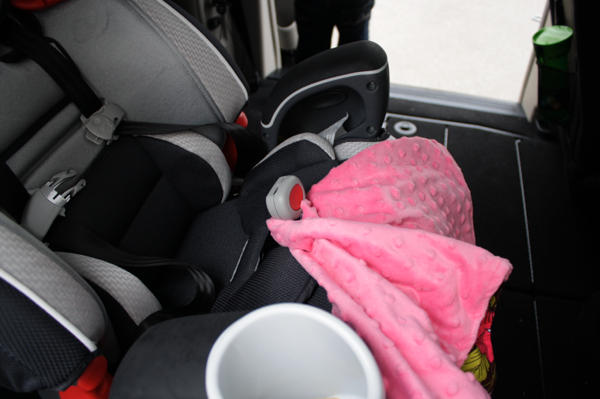 My kids like blankets in the car too, but they always end up getting dirty on the floor (the blankets, not the kids!). 🙂 I want to make them each a blanket now. I like this. at first I thought you were going to say you made velcro or soft loops to go around the shoulder straps, but I like the button hole idea. I made a carseat blanket for for my 3yo when she was 1. It had a neck hole with ribbed collar and hand holes with ribbed cuffs to stay on, kind of like a snuggie, when she was in the car or stroller. I think I need one for my current 1yo now. I think I can crochet this blanket too. The buttonholes: I had to do these manually (meaning without using the buttonhole feature on the machine) because I don’t have a manual buttonhole foot. Not a big deal, just didn’t anticipate this. 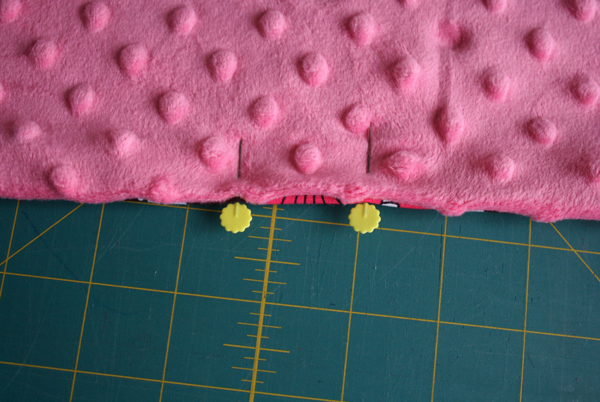 I HIGHLY recommend measuring the buckle to see how wide you need to make the holes before you sew the buttonholes. 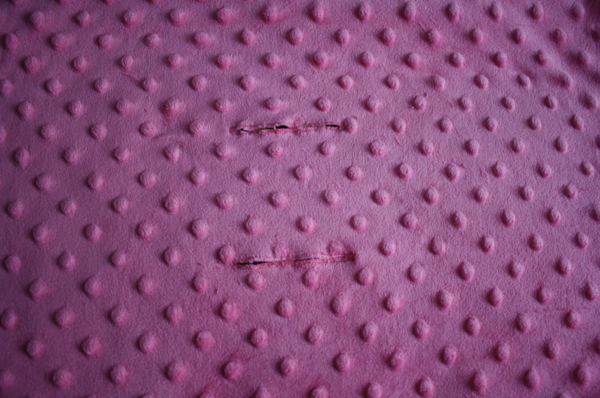 I did 2″ holes (because the tut said she wished she made them smaller than 2.5″) and had to rip them open more. So they’re not so pretty. This is awesome! How funny that I have the same carseat and van as you! I like how you made sure it didn’t get in the way of the harness! Love this idea and made one for my grandaughter this afternoon. Just one thing I would add and that is to use a walking foot if your putting together a cotton material with the Minky. 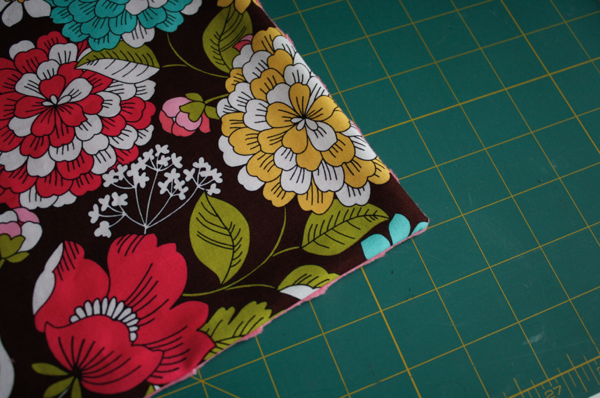 It will save you angst as the minky tends to stretch out as your sewing. Other than that this is perfect. This is a neat idea, BUT, while not UNSAFE, this still is considered an aftermarket product because it “interferes” with the straps. 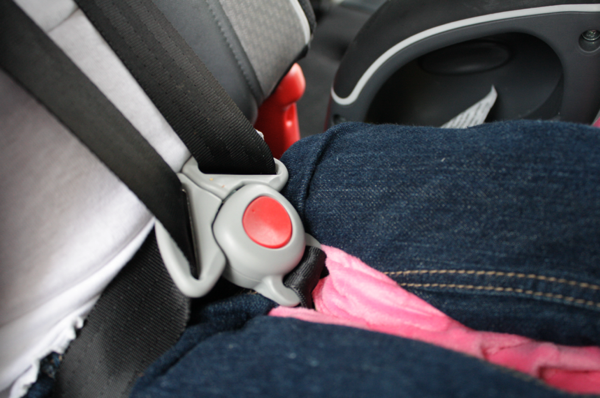 Anything that goes around any piece of the straps, whether it affects the tightening of the straps or not, is not approved by the car seat company and can void your warranty. It’s still under the harness. It’s a 5 point harness: Above left shoulder , above right shoulder, beside left hip, beside right hip and between legs. I hate to say it, but this isn’t safe. I hope others consider not adding the little hole. It is actually safe. 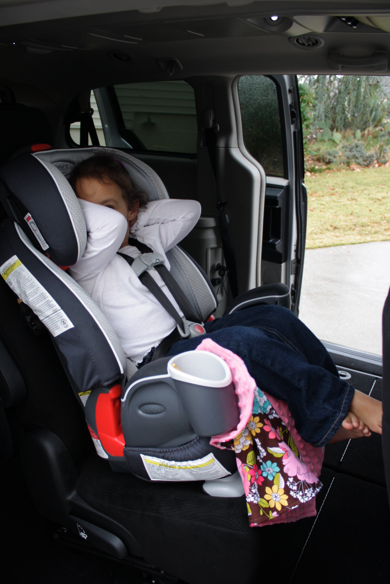 I’ve spoken with several certified car seat inspectors and they all consider it to be safe. It doesn’t impede the buckle in any way and it doesn’t add any bulk under the straps that would make them looser than necessary. I’m extremely car seat safety contentious and I’d never compromise the safety of my children or encourage others to do so, either. I love how the blanket keeps the buckle forward, too! No digging under her bottom to get at that elusive buckle!